For more information, please visit our Ferries from Ireland to France page. 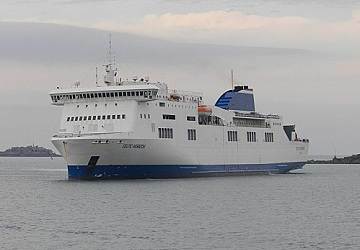 The Rosslare Cherbourg ferry route connects Ireland with France. Currently there is just the 1 ferry company operating this ferry service, Stena Line. The crossing operates up to 3 times each week with sailing durations from around 17 hours. Rosslare Cherbourg sailing durations and frequency may vary from season to season so we’d advise doing a live check to get the most up to date information. Prices shown represent the average one way price paid by our customers. The most common booking on the Rosslare Cherbourg route is a car and 2 passengers. "Relaxing start to a holiday "
Really enjoyed travelling to France this way. The only downside the shop was tiny and did not have a lot in it. Everything else was great . Will travel to France by ferry again. Everything was a lot better than what I expected. Thanks! Overal, the trip was good but the quality of the food has gone down compared with a few years ago. Also the PA speaker was not working in our cabin so we could'nt hear announcments. Apart from that it's a great setvice. The Irish village of Rosslare, or Rosslare Strand to give it is full name, is a coastal resort and port located in County Wexford, Ireland. Separating Wexford Harbour from the North Sea is a long sandspit which stretches north from Rosslare which until the 1920's stretched for many more miles north. At one point the spit almost reached Raven Point, giving Wexford Harbour a very narrow mouth. However, a storm breached the spit during the winter of 1924-25 and was thereafter gradually washed away. Located at the end of the spit was Rosslare Fort which is now abandoned. All that remains is a small island visible at low tide. The village is supposed to be the sunniest in Ireland and has been a popular tourist resort for at least the last 100 years. The town's beach has been awarded a Blue Flag and therefore attracts many bathers and families. The town's modern port has good passenger facilities and provides ferry services to Pembroke, with a crossing time of around 4 hours, Fishguard, 3 hours and 30 minutes and Cherbourg and Roscoff in France. Passenger facilities include a restaurant, a bar, children's play area and a waiting area. The town and port of Cherbourg is located on the Cotentin Peninsular in the Manche department of Normandy in the north west of France. The town's port is perhaps best known as a cross channel port serving ferries travelling between the United Kingdom and France. One of the most popular attractions in the town is the Museum T. Henry which was founded in 1831 following a donation of more than 160 paintings by Henry, commissioner of the Royal Museums. Today, the museum has a collection of 300 paintings by French, Dutch and Italian artists stretching back from the present day to the Middle Ages. Contained in the collection are "The Ascent to Calvary" by Murrillo, "Christ Died" which is attributed to Filippino Lippi, and the "Conversion of St. Augustine" by Beato Angelico. Also in the town and popular with visitors is the 12th century Abbey du Voeu which was dedicated to the Virgin. The church was consecrated in 1181, during the reign of Henry II and Eleanor of Aquitaine, who were present at the ceremony. 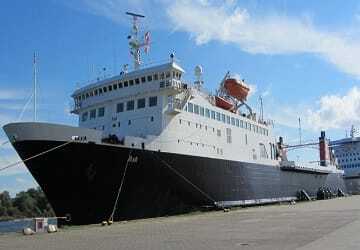 Ferry services from the port depart to Poole and Portsmouth in England and to Rosslare in Ireland.